... news, events, other tidbits. November 20: Interview with Kristena Mears--giveaway! October 31: Guest blog (the "story behind the story" of The Cumberland Bride) with Linda Brooks Davis--giveaway! October 26: Colonial Quills Tea party with Tamera Kraft, Naomi Musch, and myself--giveaways and lots of fun! October 22, 23, or 24 (TBA! ): Interview at Joy of Reading--giveaway! April-May: Blog tour with Backcountry Brides co-authors! Story highlights, author info, and lots of giveaways! 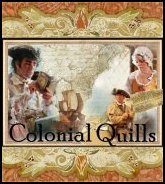 May 4: Colonial Quills Tea Party! Giveaways and lots of fun!! May: Release of The Most Eligible Bachelor Romance Collection, featuring my second novella, The Highwayman! May 4-8: Blog tour with a huge gift basket giveaway, starting right here! May 15: Colonial Quills Tea Party--more giveaways! October 16: Colonial Quills Tea Party on the CQ website and Facebook--lots of fun and giveaways! March 26: received the call that Defending Truth was a finalist in the novella category of Romance Writers of America's RITAⓇ contest ... what an honor! August 19-31: Join us for The Twelve Days of Pioneer Christmas! Stay tuned to my blog for details! August 28: Author interview, hosted by Lena Nelson Dooley. August 30: Guest review of Defending Truth by Pioneer Christmas co-author Michelle Uhl, at Colonial Quills. September 1: Author interview at Carrie Fancett Pagel's Overcoming With God. September 3: Revew of Defending Truth and other Pioneer Christmas novellas at Overcoming With God. September 6: Tea party celebrating my debut release at Colonial quills. September 12-16: American Christian Fiction Writers annual conference, Indianapolis, Indiana. Looking forward to connecting with old and new friends, and sharpening my focus on the writing craft! September 30: Interview at Colonial Quills. January: our family moves to North Dakota! Blame my mother. That's the name she said she would have given me, if she'd had the nerve. I started using it in high school as a nickname ("Shannon-doah"), and years later when we got internet for the first time and everyone was worried about privacy issues, I used it as my online persona. My first amateur attempt at a website was "Shenandoah's Eclectic Website." It was natural to title my blog "Shenandoah's Eclectic Musings," which then became "Scribblings" when I shifted my focus to provide a place for readers to come find out more about me. For years I've affectionately termed my family "the barbarian horde." We have eight children, and we are a boisterous, intense, live-life-out-loud bunch--that is, when we aren't curled up at our castle, recharging our introvert batteries.